Rhipsalis is a genus of the Cactaceae of over 60 South American species, mostly of epiphytic cacti. Some species are commonly found in tropical Africa, Madagascar and Sri Lanka, but it is probable that they have been introduced. The genus name comes from the Greek for 'wicker', in reference to the flexible branches of some species. Many have hanging stems, sometimes over 6 feet long. In nature they are hanging from trees, climbing up them, and sometimes sprawling over rocks. 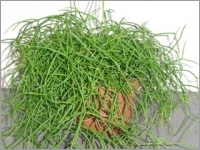 The genus Rhipsalis is being cultivated as a potted plant. The stems are tube-like or flat and leaf-like, and most of the time carry aerial roots. 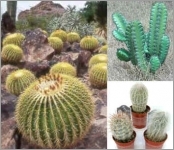 They have small, occasionally fairly long-lasting flowers which can be followed by decorative berrylike fruits. The flowers appear in the stems, opening only at night.